Cooler weather just cries out for cinnamon! 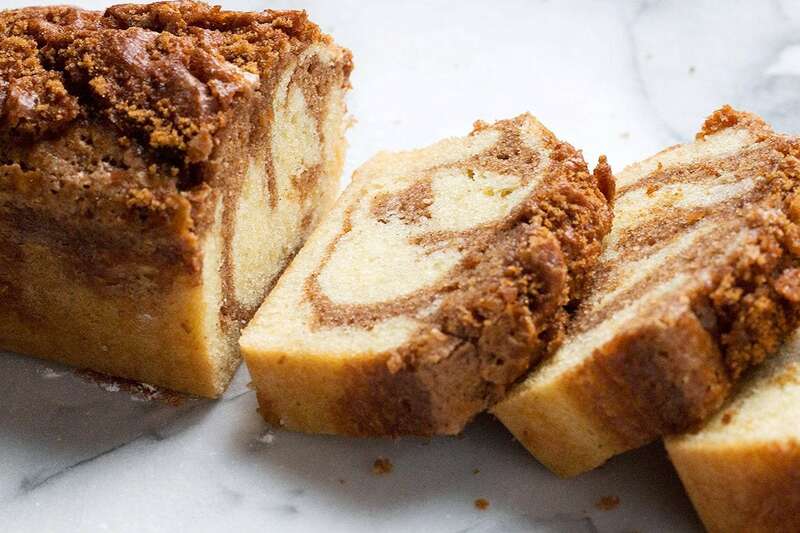 This Cinnamon Swirl Pound Cake Loaf was inspired by a trip through the Tim Hortons drive thru. It is a cinnamon lovers dream, that will fill you with all the warming Fall feelings. 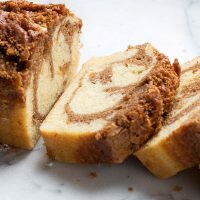 With it’s lovely swirl of cinnamon cake, combined with the vanilla cake and a crunchy brown sugar and cinnamon topping, you’ll never be tempted by the coffee shop version again! I used my tea loaf pan for this loaf. It’s pretty close in volume to a standard 8 x 4-inch loaf pan, but just slightly bigger, at 4 x 10 inches, so it produces a slightly narrower, longer loaf and shorter loaf. Of course, there is method to my madness with this choice of pan. The narrower, longer, shorter loaf means I can take a thicker slice, without actually eating any more than a thinner slice of a taller loaf (are you still with me here? :). And if you are a frequent loaf slice consumer, you know that the best part of those coffee shop loaves is the thick slices! If you don’t have a tea loaf pan, the standard 8×4-inch will work just fine. The 8×4 loaf may take an extra few minutes in the oven. When it comes to pound cake baking, starting with room temperature butter, eggs and sour cream is important, for best results. Simply remove them all from the fridge for 45-60 minutes before you start baking. Measuring the flour is another area that can make or break your pound cake. Stir your flour first, the scoop or spoon it into your dry measuring cups, then level off with the back of a knife. The “scoop and level” method of measuring flour. 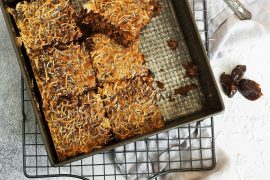 It can make a huge difference in the finished result of your baking! Finally, I do recommend full-fat sour cream for best results. 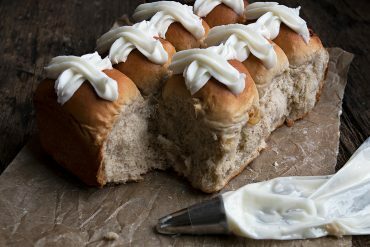 The fat in the sour cream contributes to the moistness of the finished loaf, so lesser fat versions will not perform as well. And while you could use greek yogurt in place of sour cream, it tops out at about 5% fat, while full fat sour cream is about 14%, so again, it will have some effect on the moistness of the loaf. For best results, try not to over-bake this one. Test often towards the end of baking and remove when a knife inserted in the centre of the loaf comes out clean. Longer baking will tend to dry this loaf out a bit, so getting it out before that point ensures a moist and lovely loaf. 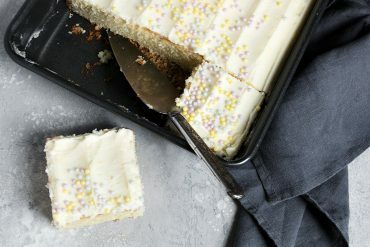 Want to add an 10 x 4-inch tea loaf pan to your kitchen? This one would fit the bill perfectly, at a great price! 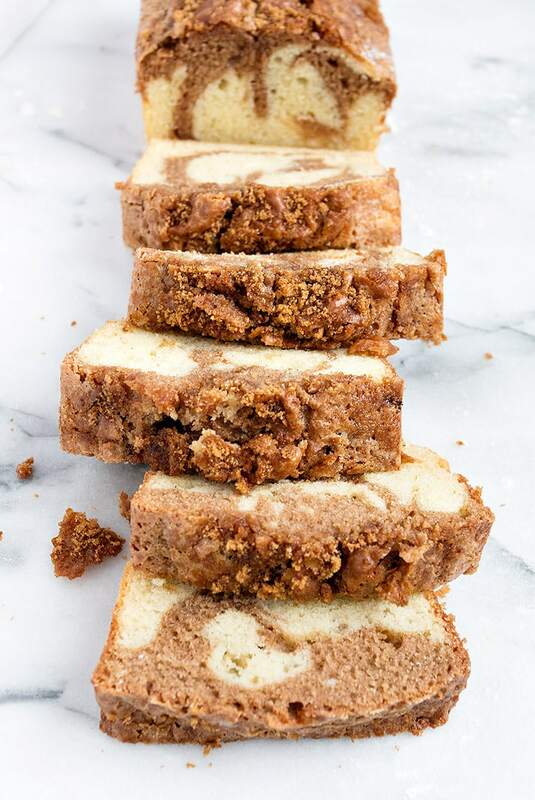 Delicious vanilla pound cake loaf with a swirl of cinnamon and a brown sugar and cinnamon topping. Preheat oven to 325F and grease an 8 x 4-inch or 4 x 10-inch loaf pan. Set aside. 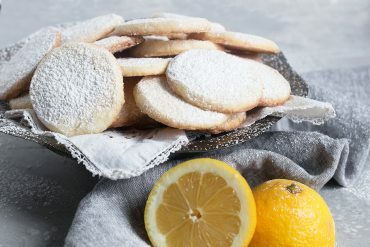 In a large bowl with an electric mixer or the bowl of a stand mixer with the paddle attachment, beat together the butter and sugar until light and fluffy, about 3 minutes. Beat in the eggs, one a time, beating well after each addition and scraping down the sides of the bowl as needed. Beat in the vanilla. In a medium bowl, whisk together the flour, salt, baking soda and baking powder. Add 1/2 of the dry mixture to the butter mixture, then the sour cream, then the rest of the flour mixture, mixing just until combined. Remove 1 cup of the batter to a medium bowl. Add the cinnamon swirl ingredients to it - the brown sugar, cinnamon and milk and stir to combine. 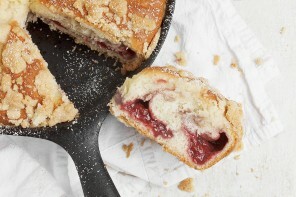 Spoon a thin layer of the plain batter into the bottom of your prepared loaf pan. 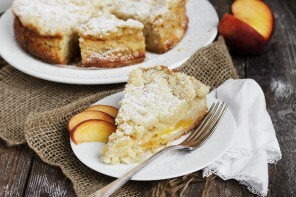 Using a spoon, drop alternating spoonfuls of the plain and the cinnamon batter into the pan. Top with the remaining plain batter and smooth the top. Using a long skewer or knife, run through the batter in the pan a few times (either lengthwise or from side to side). Just about 3 lengthwise or 4-5 side to side should do it). Make topping by combining the brown sugar and cinnamon in a small bowl. Sprinkle over the top of the loaf. Bake loaf in the preheated oven for 55-65 minutes, or until a knife inserted in the centre of the loaf comes out clean. 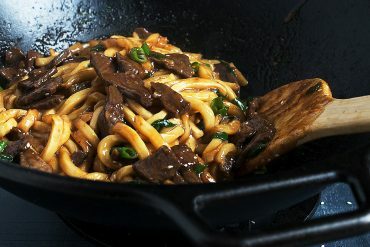 (4x10 pan will cook more quickly, 55-60 minutes, while an 8x4 will take a bit longer, closer to 65 or a few minutes more). Allow loaf to cool in the pan about 10 minutes, then run a knife around the outside and remove to a cooling rack to cool. 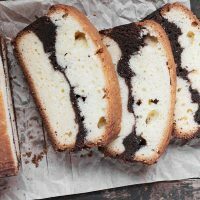 Vanilla Pound Cake with a layer of chocolate brownie! 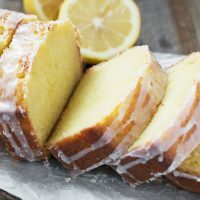 A classic lemon pound cake with a lemon glaze. 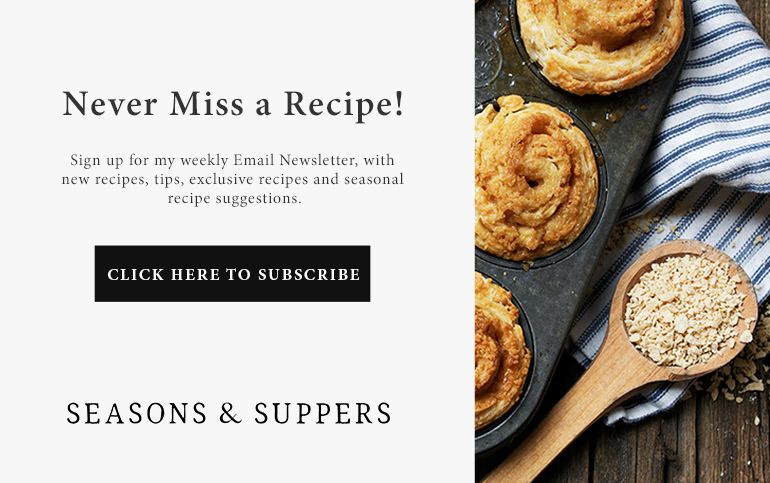 Hi Danica and sorry for the delay in getting back to you (was away for the weekend :) I’m sure you have baked them already, but just to answer your question anyway, it should be find and pretty much the same baking 3 at a time. You could switch their position in the oven, if your oven has a hot spot, but other than that, all good. Hi Ca, I would not cover completely, as the topping is likely to get soft and soggy. I would return it to the loaf pan after completely cooling and just lay a piece of plastic wrap loosely (not air-tight) over the top and leave to sit on the counter. Made it ~ divine! There were thumbs up all ’round. Texture was great and moist (nothing worse than a crumbly dry pound cake). I think the crunch on top was the best. Must remember that for other pound cake recipes…maybe using demerara or turbindo sugar for extra crunch factor. So good! Just made it. Perfect for a very snowy day in Victoria! So glad to hear, Nadine :) Thanks! Such a dreamy loaf, I love the cinnamon swirl! I made this 2 days ago; very easy to make and so incredibly tasty that the family polished it off already! Will be making it again very soon! What’s nice is that these ingredients are what I always have on hand. Thank you for your wonderful site! I come here to be motivated to make dinner! And find myself making so much more. The texture of your cake looks absolutely perfect Jennifer, it’s going on my baking schedule!! Jennifer!!!! This loaf looks absolutely amazing! 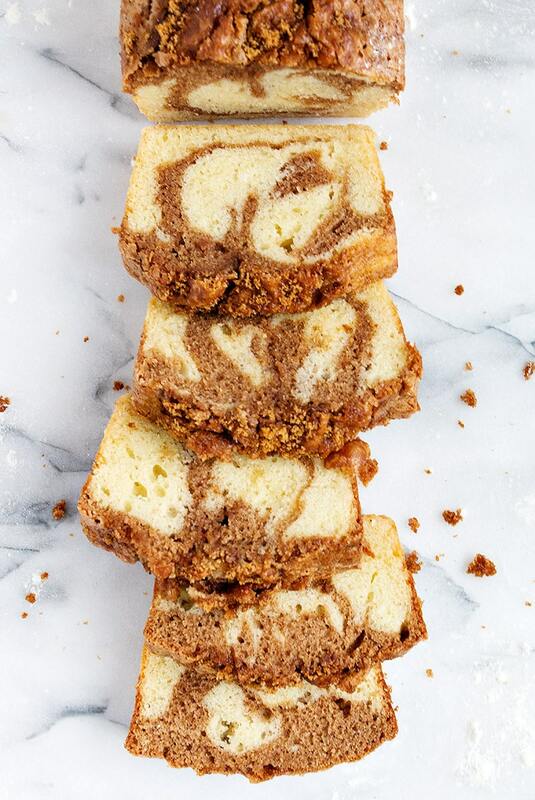 I am a sucker for anything cinnamon, so this gorgeous swirl pound cake is just screaming my name! I am seriously salivating right now (please send napkins)! Totally making this soon! Pinned! Cheers! Haha! I could totally see me getting inspired in a drive through line. Yours looks better than anything I could imagine buying! 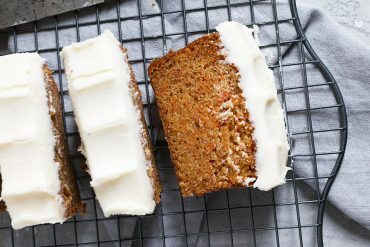 I’m a big cinnamon lover Jennifer, so this is definitely the cake of my dreams! Can’t wait to bake a loaf! What a beautiful pound cake Jennifer! My family would go nuts for this cake, especially this time of year. Love the warm cinnamon brown sugar combination. Pinning!